It is so nice to be able to write my anniversary blog post about a really good race. 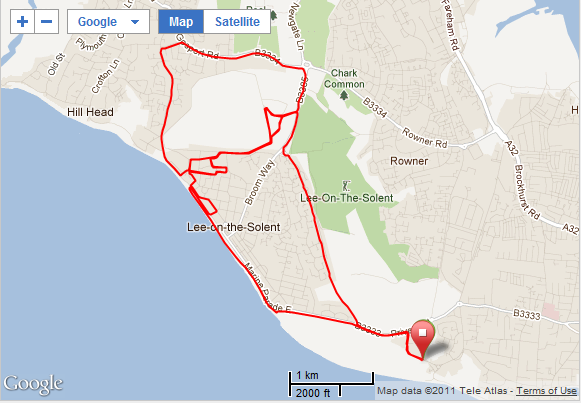 Yes, the Gosport Half Marathon does what it says on the tin… Its flat, fast and has pb potential. I didn’t manage a pb, (that’s more about my training than the race) but I had an enjoyable race on a wonderful autumn morning. (If a little unseasonably warm, but I imagine far better than any potential November alternative!) The race is a good size (2000 entrants), friendly and extremely well organised and marshalled. Highly recommended. I’ll be back next year (with a wee bit more training) to have another go at bagging a pb! Our morning went well, we were up and out, without too much hassle from the teenagers (they did get tea in bed!) before 7.30am and left the Isle of Wight on time on the 8am ferry. I was dropped off at the race around 9.15 and needn’t have worried about cutting it fine for a 10am start because I walked past some Sea Cadets trying to inflate the start/finish on the way in, plus the organisation at race HQ (a school) was slick and I collected my timing chip and deposited my bag very quickly. There were also minimal queues for the loos! We assembled at the start where I lined up about 2/3 of the way towards the back. There was no jostling or elbowing to get to the front in fact most of us were discussing whether we should slide a bit further back and it was an over polite matter of ‘after you’, ‘no after you’… to move forward and fill up the gaps! The race started on closed roads where the field of runners took over the road. Before mile 1 we were directed onto a cycle path where we could run 3 or 4 abreast. I took care to keep checking my speed and easing off as the pack was moving at a good pace and I was mindful of how I’d feel 10 miles further on. After mile 2 we entered Daedalus Airfield for a first 3 mile loop. It was here where the water stations were and lovely marshalls offering Jelly Babies. I was on target pace, slightly ahead of Mr Virtual Partner and going well. A friendly crowd with a few passing conversations along the way. At one stage I was asked by a passing runner for the time and pace and was happy to give stats having been in that situation last race myself. My first wobble came at about 8 miles just after we entered the airfield for a second time for a reverse loop. My glutes and achilles were getting painful, my legs felt heavy and my pace was falling. I zipped up my man suit, sprayed on some ‘Man up Spray’ and with Mr VP telling me he had overtaken me for the first time it was enough to spur me on to keep up a little more effort and for the next bit I managed to keep from loosing it completely by anger – at Mr VP (smugly telling me he’d finish sub 2 before me!) and other runners for rattling, overtaking on the inside or sniffing. My spirits were lifted as we left the airfield after mile 10 with a wonderful view of yachts on the Solent and the Isle of Wight looming through the clearing fog. Yes it was a flat race but the two small ramps down and then up, to and from the sea front arround mile 11 to 12 were killers on my poor dead legs! My wheels fell off at mile 12 where my legs and glutes were really painful, my legs felt like lead and I was shuffling, hardly able to lift my legs. It really was a matter of mind over matter and mental grit at that point, not to give up and walk but to keep up some effort. Before mile 13 I was overtaken by a couple and I hitched a ride tucking in behind them using their energy to follow and try to keep up with them to the last corner. Funny how the human body is…. feeling completely beat at mile 12 to soldier on and find at mile 13 a few more beans and even muster enough umph for a moderate sprint finish! Great medal, nice reusable cloth goodie bag and including the best bit of all, a nice slab of delicious ginger cake! Yum! No, it wasnt a PB but I’m pleased to be where I am. I managed to maintain my target pace for 7 miles. Not too shoddy a performance seeing as I was a bit light on training mileage and I have to remember that I have only been back running after injury for 7 weeks. Race experience helps and I’m learning that for my target HM time, I probably need to include a couple of runs of at least 13-14 miles and more mileage so I can keep pace for 13 miles. 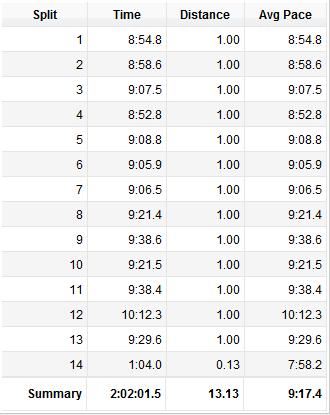 However, my finish time is in line with pre-injury times and only 3 mins off my PB. So all in all a good run. Onwards and upwards! My family report a very interesting morning at one of Gosport’s excellent museums – Explosion, Museum of Naval Firepower after a breakfast of hot chocolate and bacon butties on Lee on Solent sea front. So it’s not all bad having to get up at the crack of dawn on a Sunday because of ‘Mother’s’ running habit! 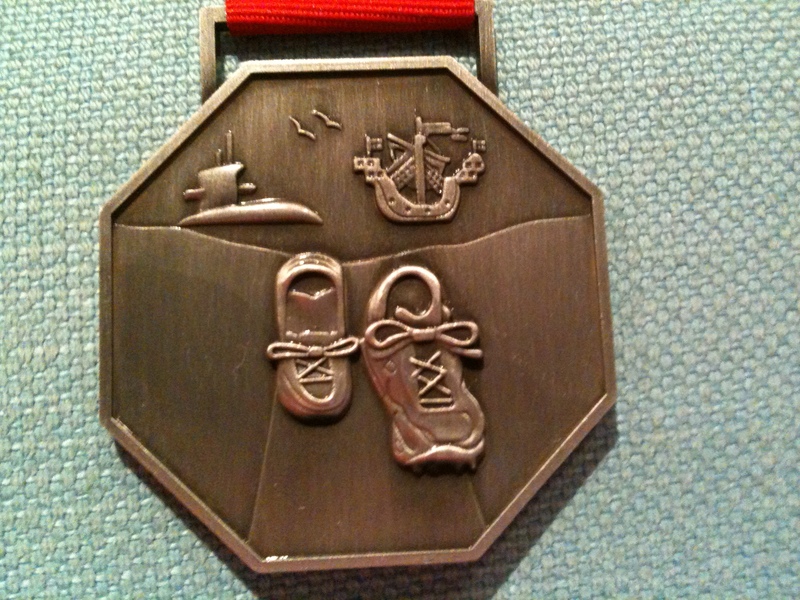 Categories: Race report, running | Tags: Gosport, Gosport Half Marathon, Half Marathon, half-marathon training, Isle of Wight, Races, Running | Permalink.